Ringworm is a fungal infection affecting the skin, nails, feet, hands or scalp. It is caused by microscopic fungi living on the outer layer of the skin and people can contract it from direct skin-to-skin contact with infected people or animals, according to the NYU Langone Medical Center. The appearance of ringworm resembles circular, reddish patches with raised borders and clear centers. Ringworm on the scalp begins as small bumps growing in a circular pattern that eventually grow larger, causing brittle hair and breakage. 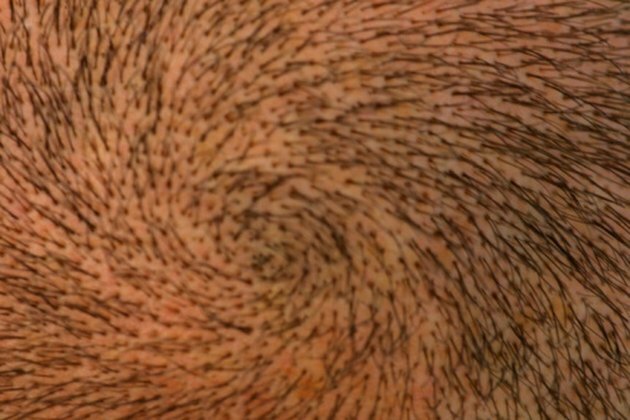 After the ringworm is treated, hairless patches on the scalp are left behind and growing back hair becomes a concern. Grow back hair more quickly by using a product containing ketoconazole, a synthetic antifungal drug, which stimulates hair growth according to a 2005 study reported in "The Journal of Dermatology." Purchase Nizoral shampoo, which contains ketoconazole as its active ingredient, and use twice a week. Nizoral is sold as a powerful antidandruff shampoo that works by killing off fungus and according to Nizoral, ketoconazole binds to the natural protein in hair and keeps working between shampoos to ward off fungus regrowth. You can use Nizoral shampoo in conjunction with any oral or topical ringworm treatments while treating the infection. Wash and condition hair daily with shampoo and conditioner between the twice weekly Nizoral shampoos. Do not treat hair with hair color, hair straightening or permanent curling until hair damaged from the ringworm has grown back. Cut your hair shorter to help the regrowing hairs blend in better. Hair is not permanently lost after a ringworm infection and will eventually grow back. Making sure the infection is treated and with the use of Nizoral shampoo, you will notice hair regrowth more quickly. Keep your scalp clean and dry. Prevent re-infection of ringworm by avoiding contact with other infected people or animals. Shampoo your hair every day to prevent re-infection. Do not use Nizoral shampoo more than twice a week or according to package instructions. What Are the Treatments for Folliculitis on the Scalp?